The 1996 vintage is regarded by the producers in St. Emilion as a "Tres Bonne" vintage with 15+ years of cellaring potential. 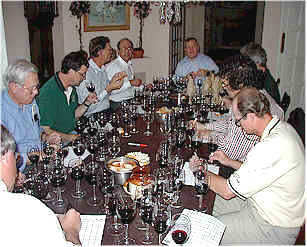 The wines, though made predominantly of Merlot, were hardly the fruity, roly-poly wines we see from many West Coast Merlot estates. 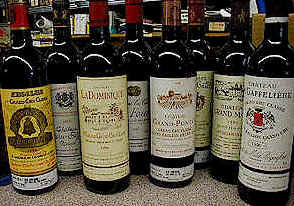 These were big-structured wines, for the most part and the did have sufficient tannins to warrant serious cellaring. The terroir in St. Emilion is a sandy alluvial soil, except in the areas bordering Pomerol where it's more gravelly. 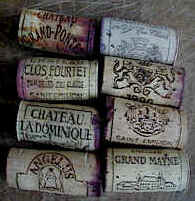 The wines, based on Merlot, also have Cabernet Franc, known locally as "Bouchet," as well as minor percentages of Cabernet Sauvignon. 1. 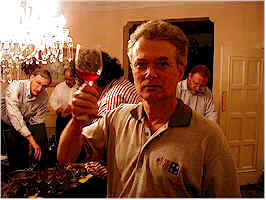 The classification is not based on "terroir," but on a tasting of a recent vintage of wine. "What have you done for me lately?" 2. The classification is updated on a regular basis, the most recent revision occurring in 1996. 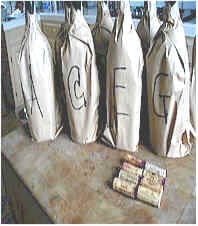 The wines are then classified as "basic" Saint-milion and Saint-milion Grand Cru. Within the "Grand Crus" there is Premier Grand Cru Class grade "A" (Ausone & Cheval Blanc) and grade "B" (currently eleven estates). There are currently 55 Saint-milion Grand Crus Classs. My tasting notes and rankings reflect my preference for wines which have a more precocious character, I suppose. A dusty and somewhat closed or shy nose to this reserved and tannic red. This estate had lost its ranking as a Premier Grand Cru Class, but regained it with this vintage. I did not find enough charm or substance to pay much attention here. Only one taster had it ranked in the "first division" (places one through four), and even then, it was a fourth place wine on their score sheet. This estate is owned by Clment Fayat, owner of Chateau Clment-Pichon in the Medoc, a lovely estate whose wine we like quite a bit. I liked the more supple texture of this wine, as well as its herbal, spicy, olive-like aromas. The oak contributes a mocha character to the wine. I was the lone first place voter, a significant number of tasters finding less to like here than did I. This winery has a significantly higher percent of Cabernets than the rest of the field, making for a somewhat differently-styled wine. I am not a fan of the jammy or really ripe fruit character in these wines, something I think is a note this estate's winemaking team strives for. I think the Lurton brothers are "dialed in" with this estate. It is often one of the more showy wines of Saint-milion, having a beautifully cedary bouquet and ripe, plummy Merlot fruit. The balance of fruit and tannin (capable of 8-15 years of cellaring in my view) is excellent. Located between chateaux Ausone and Pavie, La Gaffelire has been run by the same family for something like four centuries! Only one Vino Fino taster found something less-than-stellar here. I liked the mildly dusty Merlot fragrances and the brightness of fruit and silky texture on the palate. Even so, this shows 8-15 years' worth of tannin. I recall tasting some vintages of this back in the early 1980s and finding it to be a nice, showy bottle of wine. Its style seems similar to what I recall tasting years ago. It's got a cocoa note to the fragrance and flavor, with a fairly substantial tannin level, suggesting a decade or so of cellaring. I liked the mildly woodsy notes of this cedary, nicely fruity Saint-milion. I marked it down for being a shade out of balance with bitter, aggressive tannins. Perhaps these will round out with time. To me the nose was more impressive than the coarse palate. This was well-liked by the group, having nearly half of the first place votes. It is a very nice bottle of wine, having some herbal and olive notes and a touch of wood. There's a spice note here, too. Either this is richer than the rest, less tannic or more intensely-"stuffed," giving it an approachability which many favored.